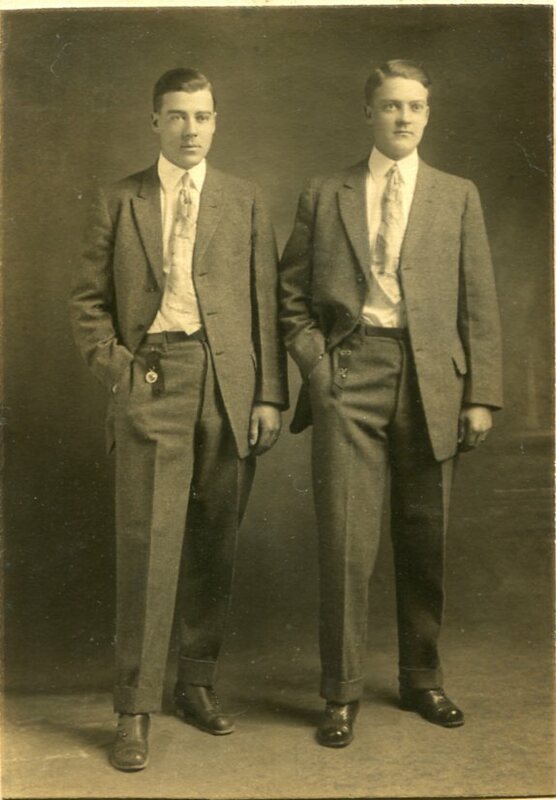 Willie Glenn and Alexander Wilson Macon were twins, and born on May 30, 1892, in the city of Louisburg in Franklin County, N.C., to William Jefferson and Susan Jordan Wilson Macon. By 1910, the Macon family was living in Louisburg, where William Macon worked as a farmer. 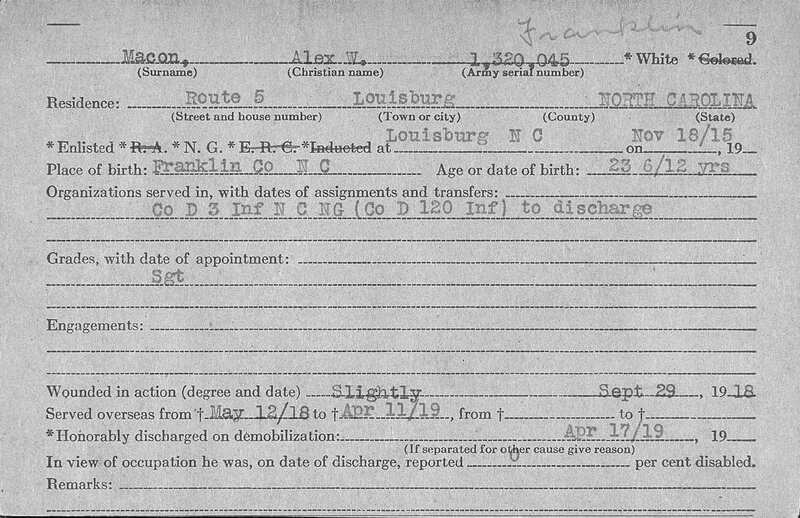 Alexander Wilson (who went by “Wilson”) enlisted in the North Carolina National Guard in Louisburg, N.C., on November 18, 1915, and assigned to Company D, 3rd North Carolina Infantry. He would serve in the Company D, 3rd North Carolina Infantry, when it was called to the Mexican border with the National Guard in late 1916, as part of the U.S. Army’s Punitive Expedition against Pancho Villa. The North Carolina National Guard was sent back to their home state by April 1917. Wilson Macon remained in the National Guard when his unit was called into federal military service for World War I, following the United States’ entrance into the war in April 1917. His unit was sent for basic training at Camp Sevier, S.C., between late August and early September 1917, where it was federalized as Company D, 120th Infantry Regiment, 30th Division, U.S. Army. Macon served in this unit for his entire WWI military service, and held the rank of Sergeant. He left with his unit from the United States for Europe aboard a troop transport ship on May 12, 1918. Macon was slightly wounded on September 29, 1918, during his time in Europe, but it is unknown where or in what engagement he was injured. September 29, 1918, was the single-most deadly day for North Carolinians in WWI, and it is believed Macon was involved in the major push on the German front lines as part of this Allied offensive. Wilson Macon remained in Europe with the U.S. Army of Occupation until arriving back in the United States on April 11, 1919. Wilson Macon was honorably discharged from active military service on April 17, 1919. Alexander Wilson Macon died on December 3, 1953, and was buried in Trinity Methodist Church in the small community of Ingleside in Franklin County, N.C.
Willie Glenn Macon is believed to have also served in the North Carolina National Guard with his brother Wilson, but there is no information on when he entered Guard service or how long he served. Willie Macon was inducted for active military service in World War I on September 4, 1917, at Louisburg, N.C. He was assigned as a Private initially to Company A, 322nd Infantry Regiment, 81st Division, U.S. Army. Macon was transferred to serve in the same unit as his brother—Company D, 120th Infantry Regiment, 30th Division, U.S. Army. He was promoted to the rank of Corporal at some point after joining the 120th Infantry. He left with his unit from the United States for Europe aboard a troop transport ship on May 12, 1918. Willie Macon was killed in action on October 10, 1918, while involved in the commune of Busigny, in the Nord department of northern France. He was buried in the Somme American Cemetery and Memorial near the commune of Bony, in the Aisne department of northern France. 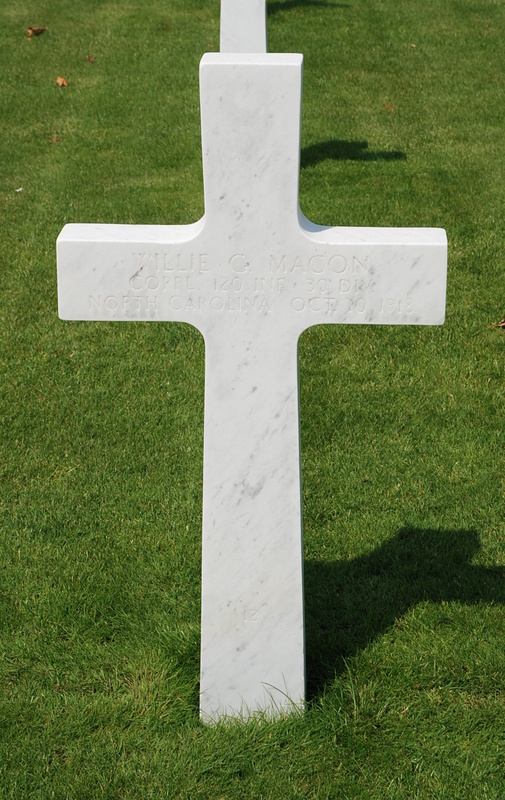 Macon is buried in the cemetery in Plot B, Row 18, Grave 12. The Macon twin's photograph is available online through the State Archives of North Carolina's Flickr page here. This blog post is part of the State Archives of N.C.’s World War I Social Media Project, an effort to bring original WWI archival materials to the public through the N.C. Department of Natural and Cultural Resources’ (NCDNCR) various social media platforms, in order to increase access to the items during the WWI centennial celebration by the state of N.C. Between February 2017 and June 2019, the State Archives of N.C. will be posting blog articles, Facebook posts, and Twitter posts, featuring WWI archival materials which are posted on the exact 100th anniversary of their creation during the war. Blog posts will feature interpretations of the content of WWI documents, photographs, diary entries, posters, and other records, including scans of the original archival materials, held by the State Archives of N.C., and will be featured in NCDNCR’s WWI centennial blog.